Trading cryptocurrencies for profit is like a business you need to understand. Or like playing poker for profit. It’s not super easy, but it’s possible. The key is to invest time in learning the necessary skills. Like in all businesses there is this one major attribute that separates the winners from the losers: Self discipline. Only the ones who take their business for serious, acquire the necessary knowledge and always do what has to be done with discipline and without excuses do succeed. The key is a clear goal and passion for that goal. Ask yourself the question: Do you really want to succeed in crypto trading? And WHY do you want to trade cryptos for profit? Are you passionate about the idea of becoming financially free? Only if you burn for this goal you’ll be able to apply the necessary discipline. If it’s more like a nice dream but you feel quite comfortable with things like they are, the drive to be a successful trader might be missing. Think about that before you start the business of crypto trading. As a trader you have to have a certain set of knowledge. This knowledge starts with an understanding of the crypto markets or financial markets in general and the underlying rules or influences leading to the current chart image of a cryptocurrency. Who are the other market participants, who is influencing the market, what leads to the chart breakouts? Understand the permanent betting game of bulls and bears against each other and their fast changing roles. In order to find trade entries and exits you need to know how to analyze price action. Technical analysis provides trading signals through different tools. You need to have a set of such tools in order to compare their signals with each other, which leads to a higher probability for a successful trade. There are tons of tools, but many are just equivalents calculating basically the same. A certain set of efficient basic TA tools is sufficient. Furthermore you need to have a set of trading strategies in the bag which you can apply in certain market environments. Trading cryptos for profit requires that you know when to buy a coin and why, how to protect your positions from bigger losses when you’re in the trade and when to take profit. You need to know the triggers that you will react to in a predefined way. High Probability Crypto Trading Strategies are kind of the core knowledge of crypto trading. Once you have learned the theory of how such strategies work, the next step is practicing. It’s important to practice trading with very small amounts at low risk. 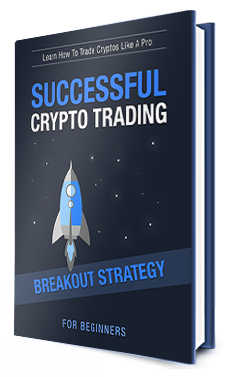 The best crypto trading strategies are presented in our ebook full version. Using broker platforms the right way is also something you have to understand and practice. Newbies can make clumsy mistakes that can lead to losses. Simply knowing about certain glitches can easily help you to avoid them. Example: Bitfinex is a broker where an order gets immediately set when you’ve clicked the buy or sell button. So if you had accidentally filled in a wrong amount, the order gets placed with that amount. If you’re lucky you can delete it again right away if it hasn’t immediately got filled. But if it got filled right away as a market order it’s done. Then you might need to compensate this mistake by placing another order right away, to get the coins back at round about the same price. Other brokers prevent traders from such mistakes by asking for a confirmation of the order you’re about to place which, like in a pop-up or similar. Especially in crypto you also need to know how much you can invest in a certain coin depending on the total supply and current trading volume. Especially when it comes to low market cap altcoins you have to be careful not to accidentally owning as much as the daily trading volume. When you want to sell them, your position would be too big to get rid of it and you would dump the market. With everything in mind a trading beginner needs to know to succeed fast, we’ve put big effort in creating a guide that provides exactly all that crucial information. Check out our crypto trading book for beginners!